You are here: Home / What are the Best Home Improvement Loans? SWD Essex Windows and Doors is the best home improvement loan available in Essex and surrounding areas offering a buy now, pay later payment plan. When it comes to your home improvement project, you may be unsure about the pricing or double glazing costs in Essex. At SWD Essex, we can offer an excellent finance scheme which won’t require you to have a lump sum upfront for your home improvement needs. Once you’ve received a free quote we can put together an affordable and feasible repayment plan that suits your budget and lifestyle. Our online quote engine is very smart. It can calculate prices depending on size, specification and design features for supplied and fitted casement windows, sliding sash windows, tilt and turn windows, uPVC front and back doors, stable doors, French doors, patio doors and bi-fold doors. But it doesn’t stop there. 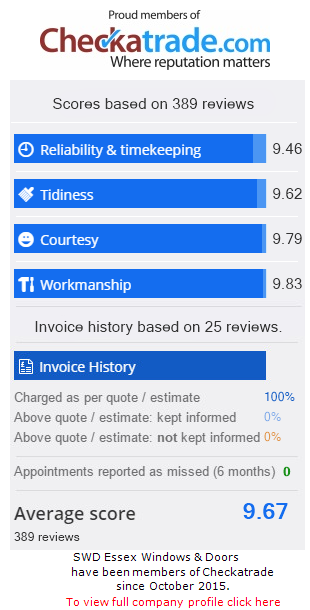 Conservatory quotes can also be calculated, both with and without building work. What makes our loan the Best Home Improvement Loan? Our finance package allows you to control how you finance your home improvements in a flexible and affordable way. Making home improvements to your Essex home leads to an increase in your property value and makes it extremely attractive to potential buyers. When you choose SWD Essex for your home improvement loan, you can be confident that there are no hidden costs and there is full transparency about the finance scheme. Be in complete control of the length of your loan, the payment plan and interest whilst enjoying the home you’ve always wanted. Replacement Windows – Our window range is large and varying in terms of style and designs. Our profiles by Liniar consist of durable and robust uPVC that is a worthwhile investment for any home. Improving the thermal efficiency and security of your Essex property, we can provide window solutions that are visually appealing and stand the test of time. Durable Doors – Our door range consists of door solutions for all types of property. Whether you’re looking for exterior or interior doors we can help. From patio doors, front doors, bi-fold doors to composite door solutions, SWD Essex have the perfect product for you. The door is your protection from the world outside so it’s important to opt for one that is extremely secure, incredibly tough as well as beautiful in design. Extensions – We have a range of extensions available including a number of styles of conservatory. It might be that you’re looking to increase the size of your home and add rooms that flood with natural light and are a welcoming place to spend time. Buy now, pay later home improvements is an investment that just keeps giving that you can enjoy for years to come. Refurbish your Roofline – Make sure you install high performance soffits, fascias and guttering to your home to make a roofline that makes an excellent defence against the elements. Protecting your brick work and roof from deterioration, water ingress and more your roofline is an important part of your property and deserves a water tight uPVC solution.